Lake Texoma water temp is 40-43 degrees, lake elevation is 617.88. Due to the crazy weather we have had this winter it has been a challenge just to keep some of my trips booked. 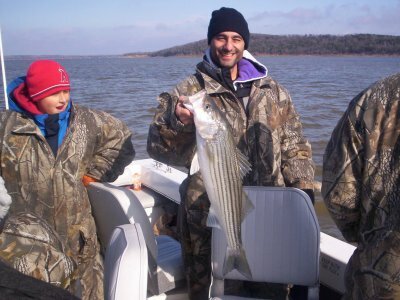 Although when were able to get our trips in the lake texoma striper fishing has been pretty good.The cold overcast days have worked out well. The sunny days with very little wind I will admit have been tougher for me. Bait on the west side of the lake is the real challenge. From Highport Marina and to the west is pretty muddy water due to the rain and snow. I have mainly fished the stained water from Mill Creek back to the north working the 45-60 foot water.